Several times a year the topic of mangy foxes comes up. Mostly this is by well-intentioned people who want to interfere. Since I end up explaining so often why that shouldn't be done, I decided to put together a blog article I can refer people to each time it happens. Of course, many people may not read all the way through all this information and there are others who just don't want to listen, but this is my attempt to let people know a few things about this. A. With out a written authorization from the Director or his designee, it is unlawful to administer any drug to any vertebrate wildlife, except in accordance with a permit issued under the provisions of this title or regulations adopted by the Board. This prohibition shall include, but not be limited to, drugs used for fertility control, disease prevention or treatment, immobilization, or growth stimulation. Nothing in this section shall prohibit the treatment of sick or injured wild animals by licensed veterinarians or permitted wildlife rehabilitators. This section shall not limit employees of agencies of the Commonwealth, the United States, or local animal control officers in the performance of their official duties related to public health, wildlife management, or wildlife removal. For the purposes of this section, the term "drug" means any chemical substance, other than food, that affects the structure or biological function of wild species. B. The Department may take possession and dispose of any vertebrate wildlife if it believes that drugs have been administered to such wildlife in violation of this section. There are numerous good reasons for this law. Even assuming that the correct dose is known and administered (not giving a correct dose may of course result in additional issues and there may be possible side effects regardless), the most common drug used, Ivermectin, is not meant to be used for treating foxes. Any such use is outside its scope. Wildlife rehabbers have even had their licenses revoked for assisting in such illegal activities as helping others treat wildlife using this medication. The usual method it is administered is by hiding it inside the food that is offered to the fox. This then assumes the fox gets all the medication and that other creatures don't consume it. If they do, that may also cause additional problems. For instance, some dog breeds, such as collies, can be sickened and even die if they consume Ivermectin. Since it hasn't been tested and is therefore not approved for use on other wildlife, how it affects them is not always known. For example, it will also kill certain species of turtles. Now you may say that turtles don't eat such foods (and you'd be wrong), but also don't forget that the medication can get into the environment through fox feces and urine and perhaps into the water ways. Such are just some of the unintended consequences that are possible. 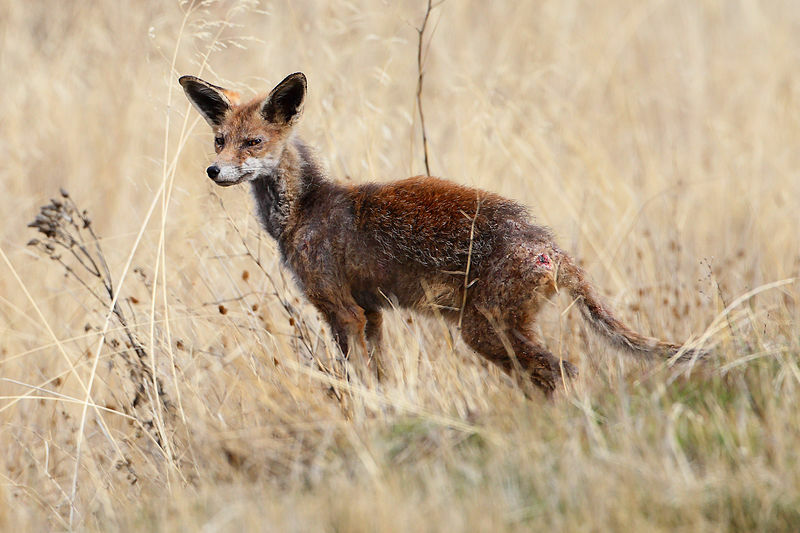 Sarcoptic mange affects red fox disproportionately from other creatures, including other canines. Grey Foxes for instance are much less likely to be affected, as are coyotes and dogs, though they can be, as can very rarely even humans. My own dog for instance was affected by mange, picked up from a mangy fox that was being attracted to my yard thanks to a neighbor unwisely feeding it, and then later I found out, also treating it with Ivermectin. By the way, feeding such creatures not only concentrates them and thus allows for easier disease transmission, but may cause them to lose their fear of man and lead to other confrontations or misunderstandings. 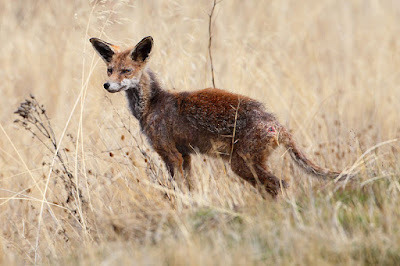 By the way, red foxes who have had mange are also more likely to get it again, as the medication does not give immunity. It may just be postponing the inevitable. But let's say that a red fox is treated and the mange goes away (though perhaps just temporarily). By choosing to try and help this predator, you affect other wildlife. You affect the prey base and the other predators who now have to compete with a predator who isn't even supposed to be here in the first place and has been given an unfair advantage by being fed. Many of these other predators themselves are declining in numbers. The red fox eats their prey (and they eat more than just rodents) and may even prey on them as well. This can include hawks, owls, shrews, snakes, weasels, bobcats, and so many more. Since in many places we have very large populations (too many?) of red foxes already, their numbers can really impact native wildlife. This not only means ground nesting birds, but of course rodents and such small creatures as rabbits. When fox numbers decline, their numbers expand, feeding other small predators and helping these small creatures themselves. But red foxes also eat fruits and other plant matter as well, directly competing with herbivores and other omnivores. So its not just quail, waterfowl and other ground nesting birds, but also raccoons and possums among so many others. By choosing to help one charismatic nonnative predator like a red fox, you have countless effects on so many others. While it may help you feel good, in the end you did not do nature a favor by interfering. The difference you actually made is often a negative one to other native wildlife, even if the things affected are not as charismatic or as easily noticed. So nature can be cruel, but its more important to think about the native natural community rather than an abundant and charismatic individual. Letting nature take its course is a wiser thing for the ecology and other wildlife. Sorry to be a downer, but thinking of the larger implications and doing so in a balanced and non-emotional way is how we should make wildlife decisions. If nothing else, please follow the law, as it is in place for good reasons. A selection of the most common hickory nuts (Carya spp.) in the DC region. Every year people ask me about different nuts they find. Hickory nuts (Carya species) seem to always come up. While I'm no expert, I thought I'd give a few pointers on telling them apart that mostly works for me. Consider it a short introduction into hickory nuts. If you plan on tasting any, I'll give a few pointers. The universal rule for most nuts is to float test them first. Take their hulls off and drop them in the water. Those that float have air in them, likely from insects, and are not worth either planting or eating. The ones that sink are the most likely to be viable and have intact meat in them. While not perfect, it works most of the time. A float test of hulled hickory nuts. The floaters have air pockets and thus not likely any good, the sinkers are heavy with meat. The easiest to identify is the Pecan (though many people don't even know that it is a hickory), since many people have eaten the shelled version before. However, Pecans are not really native to the DC area, being more of a Southern tree. Some folks though have planted it locally. Since it tends to not self pollinate very well, the few trees that do produce usually only yield a few nuts around here. The sapsuckers really like to get at the bark it seems too. If there are more than one tree, then you're in luck. I had several trees growing outside of my dorm room in college (William and Mary), but since the locals knew the timing better than I did for getting the nuts, I was pretty unsuccessful in getting much. It's a long nut with well defined ribs that stretch from end to end and has more meat to it than any of our other hickories. They are considered the best tasting. 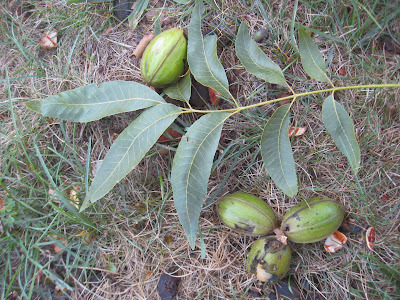 Below are a few photos of Pecans. A Pecan, Carya illinoinensis. Note the elongated look and well defined ribs on the hull. 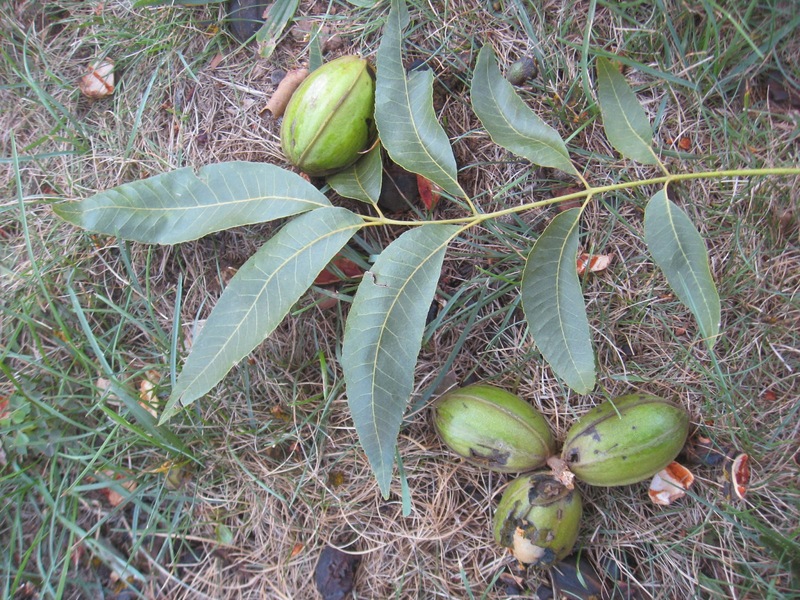 A few Pecans with a typical hickory-like leaf. Our local DC trees, since they tend to not self-pollinate well, produce only a few nuts. 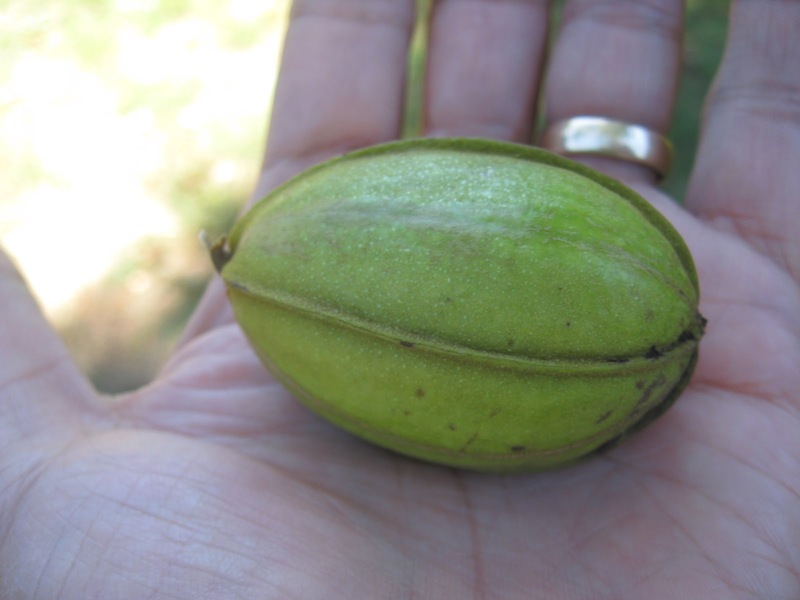 One of the most noticeable hickory nuts around here is the Mockernut Hickory. The nuts are big and light colored since the hulls split early to drop the light colored fruit. You usually just find the nuts themselves already out of their hulls. They are considered edible, but there's a good reason they're called mockers. Though by their size they promise a good yield, after cracking them you find very little meat in them to eat. They mock you by how little nut meat you get after you work so hard to crack them. Often the nut is so hard to crack that what little was in there is broken up and seems to yield even less than you could ever imagine. 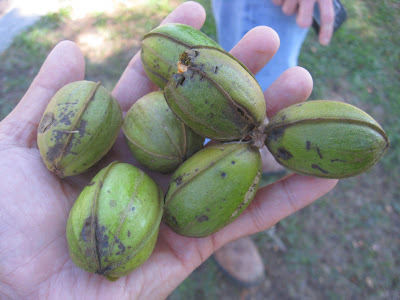 Below are some photos of Mockernuts themselves. A Mockernut Hickory (Carya tomentosa) both with and without a hull and next to its pubescent (thus tomentosa in its name) leaf. Several of the large Mockernuts on the ground with their hulls that I gathered from the ground around them They typically don't have any hulls on them by the time they fall off the tree. Shagbark Hickories are also large and said to be edible. They also are not local, being found more in the mountains than in DC. The trees themselves are easy to tell apart due to their shaggy, peeling bark. Below are some photos to help you identify this hickory. The telltale peeling bark of a mature Shagbark. Shagbark Hickory leaves and nut. The sizeable nut of a Shagbark Hickory. Much more common and fairly easy to identify is the Pignut Hickory (Carya glabra). The nuts tend to retain their hulls even well after falling from the tree. They do not have very well defined ribs and the hulls don't split as often more than just a bit down the nut. More importantly, they have what I like to think of as a "snout." Now, this is not why they're called pignuts, but that helps me to remember how to recognize them. While some folks consider them edible, their name comes to them due to most folks believing they're fit for hog food. Their flavor is supposed to be quite variable, but that's assuming you find viable and edible nuts. My experience is that they are often infested with weevil grubs and thus often empty or buggy. When scouting for hunting locations, I often find tons of these lying on the ground, but a quick inspection usually results in many of the hulls having the telltale hole of a weevil. I think twice as to whether or not to try and hunt such an area as it doesn't have as much food for wildlife as you think you see. Below are some photos of Pignuts. A Pignut Hickory with leaf. Note the "snout" that sticks out. A Pignut with its snout and showing a weevil hole. Much less common and often not recognized is the False Shagbark Hickory. It goes by many other names as well, such as Sweet Pignut, False Pignut, and Red Hickory, (Carya ovalis). It is indeed quite easy to confuse with some of the other hickories and most people are not even aware that it exists around here.The easiest way to identify it I've learned is by its nuts. They have fairly well defined ribs and tend to split about halfway along their seams down the nut. Whether it has a hull or not, look at the tip though. If it looks like a tied-off balloon end, then you have C. ovalis. Said to be much better tasting than pignut and the hickory nut that follows, I've yet to try one, though I'm not sure why. I'm going to make it a point this season to do so. Below you'll find some photos that hopefully will help you identify it. A handful of Carya ovalis, whatever the common name you choose to use. Note that whether with the hull or not, the end looks like a tied-off balloon. Another very common hickory is Bitternut or Swamp Hickory (Carya cordiformis). Its nuts are said to be ill tasting, thus its common name. They're fairly small as well. The round nuts tend to hang on to their hulls, which also are extensively ribbed but only about half way down the nut. That is their best identifying feature in my opinion, though others point to their downy yellow buds as the way to go. The nuts do have little points to their ends, but not as extensively as the pignut or sweet pignut. The photo below may help with identification. Bitternut Hickories still hanging on the tree. Note the ridges that go about half way down the nut and the pointy end. So that's a quick down and dirty look at our local hickory nuts and how I tell them apart (most of the time). Hopefully these clues can help you as well. Among the largest and most commonly seen spiders in the Fall are the Spotted Orbweavers (Neoscona crucifera and less commonly Neoscona domiciliorum). With webs that can be over 2 feet wide and their tendency to attach them at just above eye level to structures such as buildings, these seem to call attention to themselves this time of year. During the earlier part of the year you likely never noticed them. Not only were they much smaller as spiderlings, but they hide during the day. They would tear down and consume their webs every morning, so you often didn't notice their webs they constructed nightly. They did this to avoid daytime predators such as birds or wasps from finding them. Mud Dauber wasps for example often sting and paralyze many of these when they're young, stashing them in their mud nests as living paralyzed food for their own babies. But by Fall, they're often too big for wasps to eat. Many wasps have also concluded hunting and egg laying by this late in the year. So the spiders sometimes hang out during the day. Many birds also don't go after them as much, having no babies to feed or they themselves leaving on migration South. Prey also gets scarcer as it gets colder, so leaving the web up during the warmer day increases the chance of a catch. Consequently, Spotted Orbweavers don't hide as much and also don't tear down their webs and rebuild them at night as much once autumn arrives. So while there are definitely fewer of them around, they're bigger and hide less. They also often choose to build their webs around our porch lights and buildings, as the artificial lighting attracts insect food to get snared in their webs. They now stay out more often and tear their webs down less, all the way until the first few frosts kill the adults. Their webs are good at intercepting all sorts of aerial or jumping prey. A Spotted Orbweaver captures a katydid. Spotted Orbweavers and other members of their Genus Neoscona (which mostly look similar) are sometimes called Barn Spiders. That name however is better applied to another large orbweaving spider, Araneus cavaticus. They look quite similar but these are much less common in the DC region. They have wider "shoulder" and lack the broken "L" shape (the spots that give them their names) on their abdomens that Spotted Orbweavers posses. A look at the spots on the belly of a Spotted Orbweaver in a broken "L" shape that gives them their name. Their scientific name has interesting origins. Eugene Simon, the person who named the Genus as Neoscona in 1864, was just 16 years old when he did so and not good at speaking Greek. Finding one "in the reeds spinning a web", he meant to say just that, but instead the name he gave it translates to "spinning a reed." Despite the goof, the Neoscona name stands. The specific epithet "crucifera" means "cross bearer" due to the shape the markings often take. Some call it a Hentz Orbweaver Spider as the person finding this particular species was named Hentz. In fact the previous accepted scientific name for it use to be Neoscona hentzii. To make names even more confusing, another very similar spider, Nescona domicilorum ( meaning "house dweller"), which is a bit more brightly colored and has other difficult to see differences is also called the Spotted Orbweaver. Luckily as far as life style, they both are much the same so what I write here pretty much holds for both. A Spotted Orbweaver hangs head down in its web at night. These are large spiders and so easily seen in the Fall near our buildings and sometimes causing concern. But they are relatively harmless to people, only biting under duress. Though almost all spiders have venom, many cannot even break the skin. This one does get large enough to potentially do so, but a bite is rare and supposedly only results in a tiny bit of temporary pain or maybe swelling. The web, as mentioned, is generally 5-8 feet high and often 2 feet across. They often use existing structures like buildings for support. Other wise they're a typical orb web, with concentric circles and with sticky spoke web connections. The spider hangs head down in the middle when hunting (though they can hide in a corner or in a folded leaf when scared, making use of the hidden retreat). While both males and females make webs when young, the males stop making them when they become adults and instead go in search of a female. Once they mate, females usually lay a single egg sac holding about a 1000 eggs that is commonly hidden nearby in a folded leaf or other cover. There they overwinter and baby spiderlings are born in the spring, often throwing silk into the air to parachute away and create their own orb webs. I get many inquiries about these spiders "showing up" by porch lights and buildings in the Fall, the people not knowing the spider has been hiding there all summer, venturing out at night to build its web before recycling it by eating it in the morning. It's only now that people notice these larger adult orbweavers, not realizing they benefited from the spiders catching prey the whole summer long, never causing a problem and very unlikely to cause any now. A Spotted Orbweaver near its retreat, or hide, a curled leaf shelter hanging from its web. A Northern Watersnake basks in an Arlington, Virginia pond. The Northern Watersnake (Nerodia sipedon sipedon) may well be the most misidentified snake in the East. Due to its living in close proximity to water, large size, variable coloration, ability to flatten its heads to appear triangular, and what some consider a feisty nature, many people confuse it for the venomous Water Moccasin (Cottonmouth) snake. This despite cottonmouths actually not living in the DC area, being limited to Southern Virginia at most. A Northern Watersnake eating an American Eel it has dragged out of the water. Not the dark bands thickest along the top of the body. Northern Watersnakes are thick-bodied snakes, up to 55 inches in length (though most are 2-3 feet on average). They can have a wide range of color, and the tannins and mud in the water may also stain them. Most however have dark bands across their back that are wider than the light colored bands along their bodies. The dark bands narrow along their sides and thicken along the top of their backs. These bands tend to turn into blotches by the time they reach their tails. The bands also fade as they grow older, becoming difficult to see on the oldest and largest specimens. These snakes also have crescent-shaped marks along their bellies, but that is obviously not an easy thing to see. Note the crescent-shaped marks along the belly of this watersnake. The tail is almost completely dark underneath. Watersnakes (all one word is the scientifically accepted way of spelling the name) are quite common, being found in every county in Virginia and almost all the DC area. They are almost always found in close proximity to water. They can swim completely submerged, which differs from many other types of snakes. Juvenile Northern Watersnakes are more boldly patterned than adults. Note that the dark bands are wider than the light colored ones and that they are widest at the top of the back. This youngster is swimming submerged underwater. Because fish and amphibians are so slippery, watersnakes have very long and pointy teeth, pointing backwards to help hold on to prey. They also have a mild anticoagulant in their saliva. Since they will bite defensively, this can make a bite look scary, though the watersnake really can't do any real harm. The vast majority of the time they try and flee. If captured or cornered, they will flatten out to look bigger, hiss, strike, musk, and even discharge feces, so it's best if they're left alone. Some people report being attacked by them, but what has often happened is that the snake is trying to get to a burrow that the person is in front of, or trying to get aboard what they think is an island when it's someone canoe. They really just want to get somewhere and a person happens to be in the way. This unfortunately adds to the misconception that they're dangerous or aggressive however. Female watersnakes are larger than males, sometimes twice the size. If you see a large one, it is almost certainly a female. This size difference allows them to be able to produce more young. From 6-70 (though 20 is more typical) young are born alive from eggs retained within the mother's body, often from August through October. The largest females produce the most young. Males are attracted to females, finding them by searching for pheromone trails. This sometimes result in "mating balls" of one large female surrounded by 2 or more suitors. If nothing happens to them (lots of things such as herons, raccoons, large fish, snapping turtles, foxes, and mink will eat them, specially when young), they can live up to 9 years and 7 months.